PRICE: $3950 per person based on double occupancy. Hike the Crater of Lake Cuicocha, horseback ride through the highlands or tube down a river in the Cloud Forest. Soak in a luxurious spa above the clouds in the glorious town of Baños. 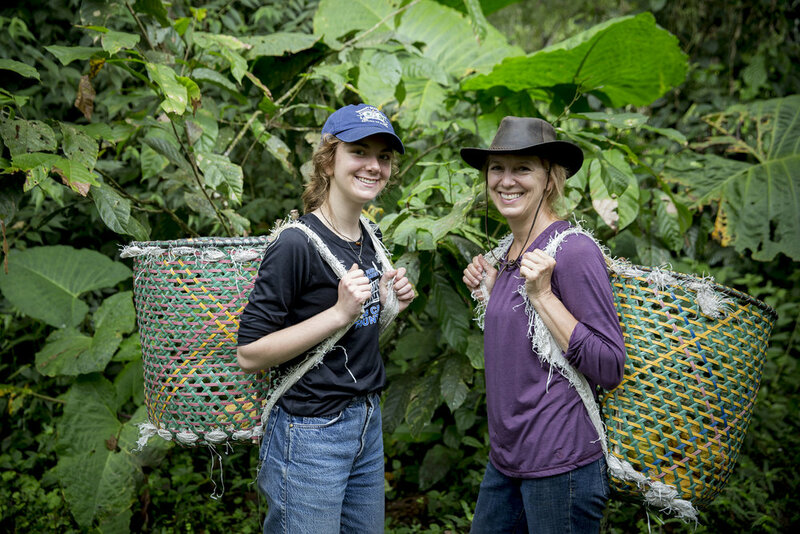 Experience living in community in a home-stay outside Otavalo and learn the bean-to-bar process of chocolate farming in the jungles of Mindo. After breakfast, we bid farewell to our host families and head out to the small town of Cotocachi. We'll all take the morning to explore the shops, known for leather goods and handicrafts. This area is full of outdoor activities, the most famous being hiking around the crater of Lake Cuicocha. If that's not for you, simply enjoy the epic scenery... it's breathtaking. For an additional cost, you can book a horseback ride or mountain bike tour. We cross the backbone of Ecuador, riding along the beautiful Pan-American highway. We'll climb steadily to an incredible 14,000 feet! Felipe, the owner of Paqocha- a business dedicated to bringing alpacas back to Ecuador- will be meeting us. We'll visit these communities, see alpacas and meet the women who shear, clean, and spin the gorgeous alpaca fleece. Heading north to Baños, we'll land at a cliff-side spa where you’ll have a full afternoon and evening to zen out overlooking the town and mountains. Take advantage of having the full day to relax in this luxurious place. After this epic journey you will appreciate it! We'll have a final late lunch all together before heading out to the airport. Discover Quito’s history, museums, food and art on a meandering walking tour. You'll need today to acclimate to the altitude, so drink plenty of water! Today we head out to Mashpi Artisanal Chocolate Farm, owned and operated by a small Ecuadorian family whom we love. Here, we'll meet the farmers, Alejandro and, tour the farm, taste and learn all about the chocolate experience. Day 4: Become the Farmer! We head back to the Mashpi to do whatever needs to be done from harvesting to separating beans. Afterwards, we'll head to the quaint village of Mindo to explore more of the cloud forest. Today we'll explore more of the incredible beauty that the cloud forest has to offer. We'll visit the famed Butterfly House and lunch in the gardens. We will head up to the gorgeous region of Cayambe. After lunch, we'll venture out to meet local women farmers and learn about agave harvesting, which is very popular in this region. Hands-on cooking class with Michelle O-Fried! Visiting the local farmers market with her is a true treat, and an amazing way to learn about Ecuador’s produce and cuisine! We'll bring our bounty back to our beautiful kitchen where she'll teach us some traditional recipes. We head north to Otavalo, stopping at Ecuador's largest artisanal market. After shopping and lunch you will be meeting the leader of the Runa Tupari Foundation, which helps rural indigenous communities develop sustainable tourism. From there, you and your roommate will make your way to the home of your host family. 14 nights in various lodging from historic haciendas, a homestay, ecolodge, jungle lodge and luxury spa. JUNE 27-JULY 10 2019: 8+ available, shared rooms with 2 beds.